If you’re a writer, budding or established, do you spend enough time doing nothing, do you take time to stop and stare? Do you ever just sit or lie there, and look at the view? No less a giant than Byron did just that. 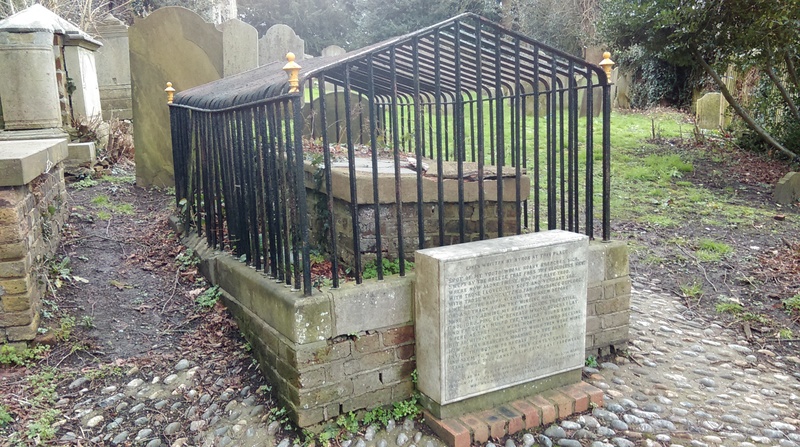 On this tomb in the churchyard of St Mary’s church in Harrow-on-the-Hill. 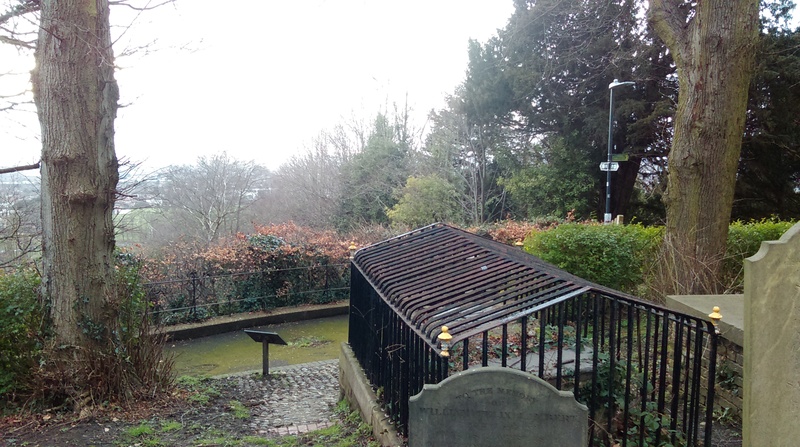 It was presumably in better repair then, and without the railings subsequently put on because of the very fame he had brought it. 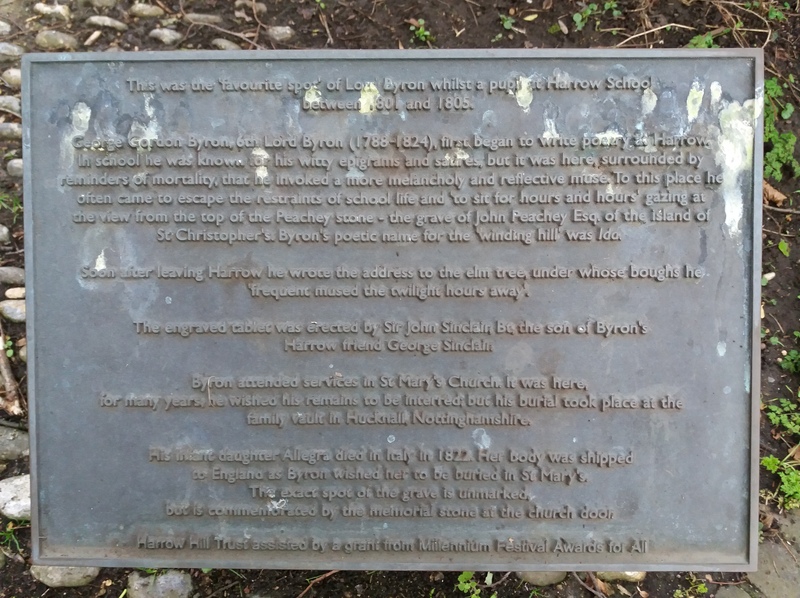 Its occupant was “John Peachey Esq, of the island of St Christopher’s”, who has thus gained prolonged and unintended fame because of his grave’s location and the identity of its famous lounger. 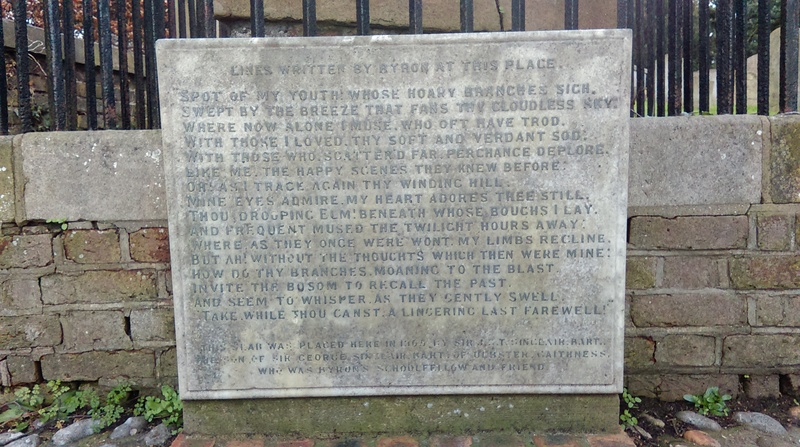 His poem “Lines Written Beneath An Elm In The Churchyard Of Harrow” can be found at http://www.famouspoetsandpoems.com/poets/lord_byron%20/poems/5989. The first verse is reproduced on the stone at the front of the tomb, put there in 1905 by the son of one of his school friends. 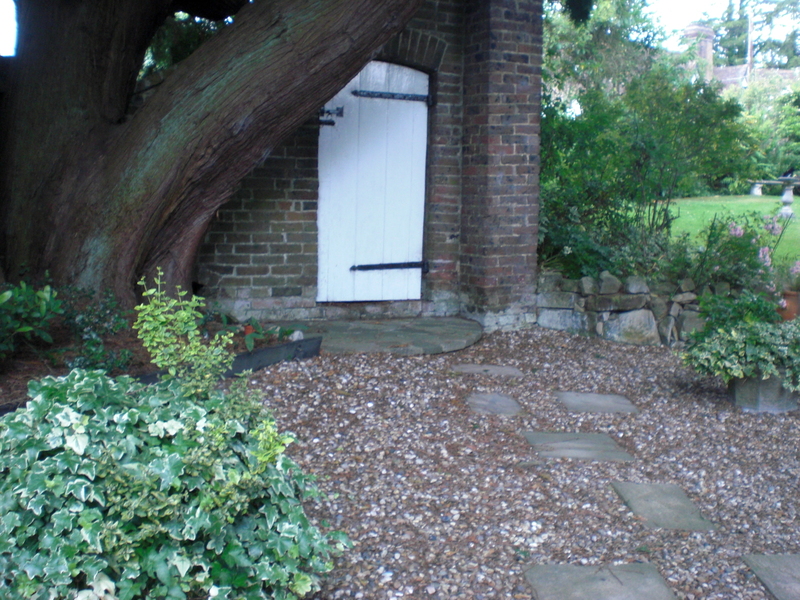 This is the month of the Tonbridge Poetry Trail. 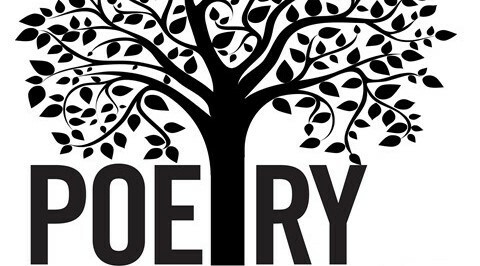 Poems of several local poets are displayed in the windows of many local shops, from Optimum IT Solutions at the north end of the town to Sulston’s Kitchen in the south (see https://roundelpoetrytonbridge.wordpress.com/events/ for more names). 24 shops, 24 poets, 24 poems … Maps are available in most outlets. It’s all sponsored by the Tonbridge Festival. My train journey home on Tuesday evening was muchly delayed – long enough to qualify for a refund! “Signalling problems in the Chislehurst area …” But no worry: I had a seat, and some good reading material. Two good reading materials in fact. I settled down to a happy session. ‘A Father’s Day’ will echo with anyone who’s lost a loved one, thinking of the everyday actions that won’t be done again. ‘Commuters’ suggests ways of passing a train journey, eg “Rain makes patterns and I imagine introducing people to their own reflections, me their gentle intermediary.” ‘Counting’ describes the sheer abundance of nature: “Frank swept away twelve tons of leaves last night but morning said ‘I’ll raise you’; now the scarlet carpet is measured in fathoms.” ‘An Old Soldier’ recalls one’s youth in a way that will resonate; we won’t have in our own memory bank an Action Man stuck for years on a telephone line, but we’ll have the equivalent. 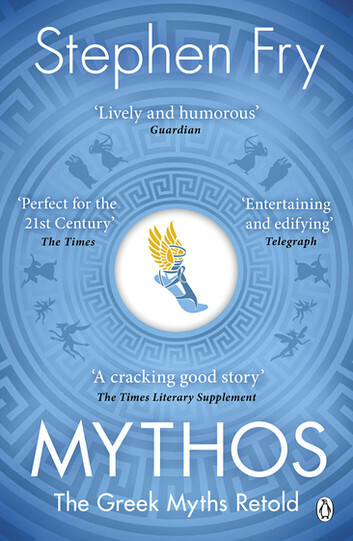 The other was Mythos, Stephen Fry’s retelling of many of the Greek myths. As you would expect from him, it’s so readable, a fresh take on familiar stories. And many of them that weren’t familiar to me. Told with affection and a modern feel. In the very first chapter, for example, describing Chaos and the creation of the universe, he explains how your trousers began as chaotic atoms, became your trousers, will become landfill, and in time will return to cold Chaos once the Sun expands and destroys the earth. When telling the story of how Europa, changed by Zeus into a cow, swims across the Bosphorus, he delights in pointing out that ‘Bosphorus’ and ‘Oxford’ mean exactly the same thing. Time and again we see the Greek origin of our words or our ideas. His imagined conversations on Olympus entertain, as does his recognition that he is repeatedly introducing us to perfectly beautiful young people, who may well (but not always) come to sticky ends once their beauty attracts an Olympian. Adonis, Ganymede, Narcissus, Echo, Psyche, Semele – they’re all here. Sometimes he gives us interesting variants on what we’re used to. Athena, for example, changes Arachne into a spider not because she presumptuously took her on in a spinning competition, but as a reward for being a great artist, the poor girl having just hanged herself in mortification a few moments before. Eventually the signalling difficulties in the Chislehurst area were resolved. But I hadn’t minded. Grindstone Literary Services Novel Prize for an opening chapter, maximum 3,000 words. Entry fee £20. 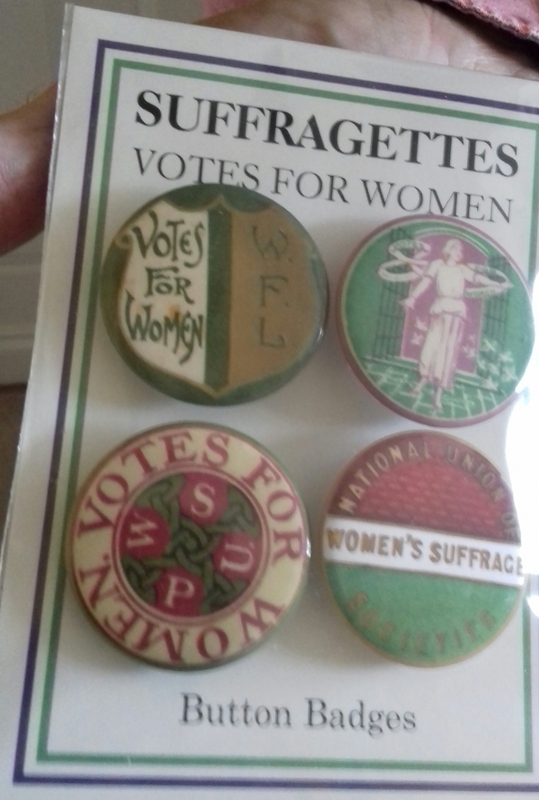 Prizes: £1,000; £100; publication. Discount on Curtis Brown online writing course. Deadline 28 September. Details http://www.grindstoneliterary.com/competitions. My apologies for being a bit late with this list – blame editing fever. As always, I rely on you double-checking any competitions you’re interested in, since terms and conditions, or entry dates, can change at the last minute. See my note above, on the Manchester Fiction Prize. Writing may be a solitary occupation, but two Medway poets have just shown how collaboration can pay off. Matt Chamberlain and Spreken came up with the idea of interpreting the other’s images. They each took photos of ordinary things, which the other then wrote about. The one stipulation was that the resulting poem contain something positive (for they had seen too much sadness in their work). 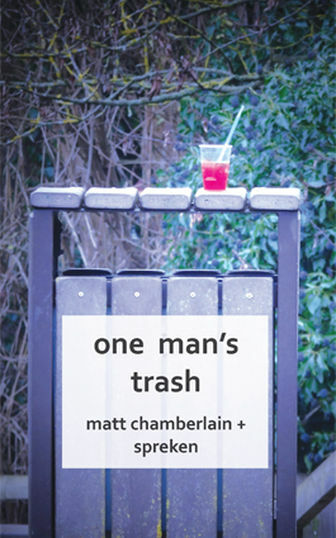 The result is one man’s trash, a collection of 14 poems. A kitchen sink full of not-yet-done washing-up; a house sprayed with racist graffiti; a sign in a car park telling you where to pay; a pair of muddy walking boots: these unpromising pictures inspire some imaginative work. My favourite is ‘Underneath’, the speculation of whatever lives under a bridge (a troll, as there’s something trip-trapping across the bridge – memories of Billy Goat Gruff?) as to who is walking over it and what their lives contain (or don’t). Another that specially appeals is ‘Grey infusion’, the thoughts of a pigeon splashing in a puddle. 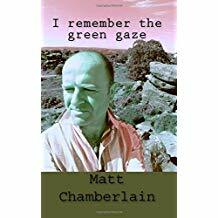 The collection is published by Wordsmithery (based in Chatham). For an interview with the two authors, speaking on how they write their poetry and how they collaborate, see https://www.wordsmithery.info/one-mans-trash . So if writer’s block strikes, or you feel your writing needs new inspiration, or is getting you down, try some collaboration like this. I admire poets’ imagery, and their ability to convey such meaning or feeling in a few words (not my own forte, so I’ve not attempted to write any since school). That’s why I liked Jane Dobson’s Fragments of Love collection so much (see https://ninevoices.wordpress.com/2016/11/24/a-poem-that-was-published-in-the-times/ below). 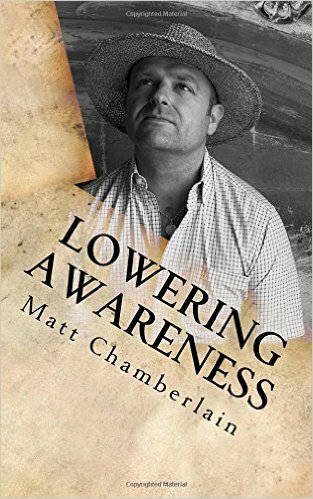 And that’s why I like Lowering Awareness, new from Matt Chamberlain. It’s an interesting mix: some moving, some comic, some so descriptive. Comic ones include ‘Give Me A Bell’, ‘Show And Tell, What The Hell?’ (which should be read by every reception class teacher!) ‘Porridge’ and ‘Toblerone’. Then there’s the atmospheric and sad – ‘Stained Beauty’ (about Saddleworth Moor) moved me a lot. 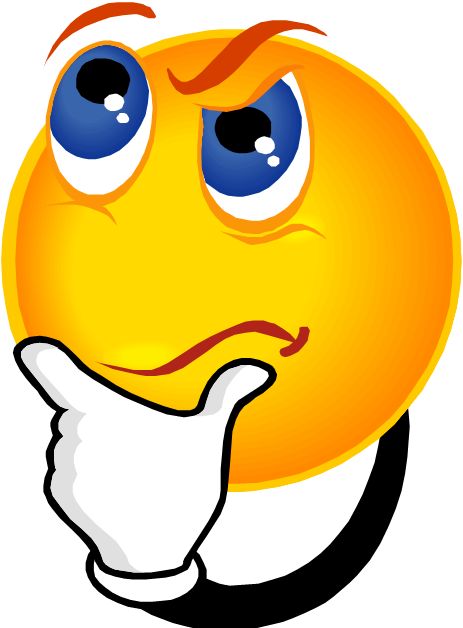 Loss – ‘Absence’ and ‘Far Away’ are two examples. 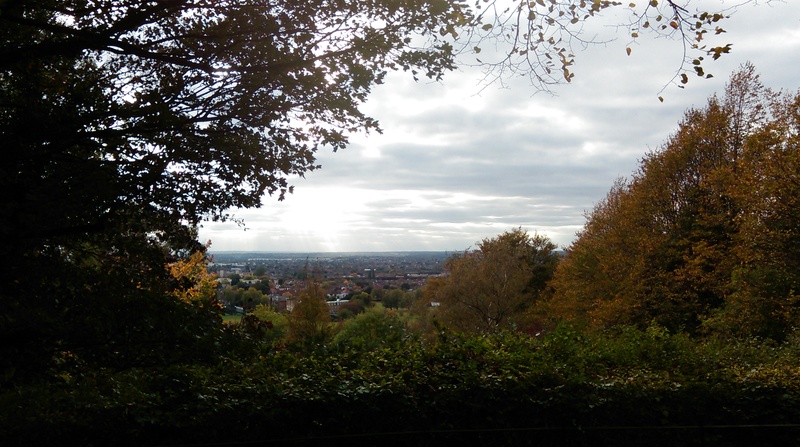 Lancashire and Kent – both are evoked. Tribute is paid to David Bowie. Read and reread, it’s worth it.